Sometimes rather difficult steps are required to solve the most difficult binary puzzles. 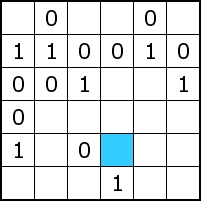 Consider for example the blue cell in the puzzle below. Do you see which number should be placed here? Especially for starting binary puzzlers this is not easy to see. We will give a step by step explanation. Maybe it's already clear now which number has to be placed in the blue cell. Regardless of the possibility we choose, there will always be a one in the fourth cell of the fifth row. We can thus fill in a one in the blue cell.